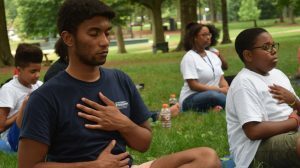 Terrius Harris and Albert Ball learn yoga in the Grove. OXFORD, Miss. – Twelve high school students from across Mississippi gained exposure to innovative problem-solving skills by participating in an entrepreneurial leadership program at the University of Mississippi. The inaugural class of the McLean Entrepreneurial Leadership Program, or MELP, met May 29-June 3 on the Oxford campus. The weeklong series of activities was sponsored by UM’s McLean Institute for Public Service and Community Engagement in partnership with the Office of Pre-College Programs. Terrius Harris and Ryan Snow, innovation scholars with the McLean Institute’s Catalyzing Entrepreneurship and Economic Development initiative, were instrumental in planning and facilitating the program. “In this first summer, we sought to introduce an initial cohort of students from around the state to the entrepreneurial approaches to addressing pressing community needs,” said Albert Nylander, director of the McLean Institute and a professor of sociology. MELP was structured to cultivate an innovative approach to solving problems that students identified in their communities. Throughout the week, participants studied principles of entrepreneurship, data and demographics, environmental sustainability, and health and wellness through readings, lectures from UM faculty and staff, and field trips to meet with community leaders. Snow, of Summerville, South Carolina, and Harris, of Eagle River, Alaska, reflected on their experiences planning and leading the program. Working with students in the inaugural MELP program has been rewarding, Harris said. MELP’s first-year goal was to pilot a scalable and replicable program that will stimulate an entrepreneurial interest among high school students that can be utilized to solve community and state problems through community engagement. The inaugural participants were Albert Ball and Ajene Buchanan, both of Oxford; Dylan Dickerson, Kyarria “Ari” Hardy, Tyteanna Wragg, Hailey Fox, Kendall Dawkins, Mister Clemmones and McKinley Ware, all of Newton; Abidemi “Titi” Ayegbaroju and Jimeya Mayes, both of Greenwood; and Baylea Brown of Magee. All enter the 10th, 11th or 12th grade in the fall. Several of the students weighed in on their expectations versus their experiences. Ayegbarojou said she had a particularly emotional moment during a session at the Robert C. Khayat Law Center. Brown said she thought she’d feel disconnected and isolated from the others during the week. The goal of MELP was to bring about this type of inspired and innovative thinking, said J.R. Love, project manager for the Catalyzing Entrepreneurship and Economic Development initiative. Besides support from the Office of Pre-College Programs, other MELP partners included the Center for Population Studies, Office of Sustainability, RebelWell, the UM Food Bank, Square Books in Oxford and Home Place Pastures in Como. To learn more about the McLean Institute, visit http://mclean.olemiss.edu.